 Hello Dolly. I hadn’t heard this was going on tour, but I thought that if it did, it would end up here. I haven’t seen this on the big stage; I think I saw a regional production in Atascadero once. So I’m looking forward to this. It will be interesting to see who they get to headline the tour, as this tends to be a star vehicle.  A Bronx Tale. 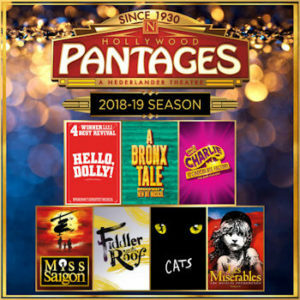 Again, I hadn’t seen a tour announcement, but if it did, the Pantages was a likely home. I’ve heard the music from this and it is quite good.  Charlie and the Chocolate Factory. I predicted this one. Looking forward to seeing it, even though it got weak reviews in New York.  Miss Saigon. Again, I predicted this one. Surprisingly, I haven’t seen this on the stage, so I’m looking forward to this.  Fiddler on the Roof. I predicted this was a possibility, so again, I got it right. On the original Broadway production, my daughter actually toured Eastern Europe on Yiddishkeyt with the actor performing Mottel. I haven’t seen Fiddler on the stage in ages, so I’m looking forward to this.  Cats. Again, I indicated this was on tour and a possibility for a retread. I saw it when it was at the Shubert in Century City ages ago, as well as a good regional mounting at 5 Star Theatricals (FB) (nee Cabrillo Music Theatre (FB) quite a few years ago. I don’t mind seeing this again — it’s a great dance show.  Les Miserables. Another show that I indicated was a possibility. I saw this quite a few years ago when a tour hit the Ahmanson Theatre (FB); I wouldn’t mind seeing it again, but I’m somewhat lukewarm. What I found interesting was that neither Anastasia or Bandstand ended up at the Pantages; I really thought Anastasia would be a Pantages show. Either of these could end up in one of the unannounced slots at the Ahmanson; it is less likely that both would (but one never knows). Additionally, reflecting on things, I think that if Natasha, Pierre, and the Great Comet of 1812 does go on tour, it would end up either at the Mark Taper Forum or another theatre that would be willing to adapt to their immersive staging (perhaps the Pasadena Playhouse, or a theatre on Broadway). For the following season, there are a number of shows from the current Broadway season that are likely to show up: Escape to Margaritaville, The Band’s Visit, Spongebob Squarepants, and many others.